PEXA (Property Exchange Australia) is a leading player in the disruption of property conveyancing services. It assists members – such as lawyers, conveyancers and financial institutions – to lodge documents with Land Registries and complete financial settlements electronically. The rapidly growing business decided to move from inherited premises across three locations into new offices at 727 Collins Street, Melbourne. 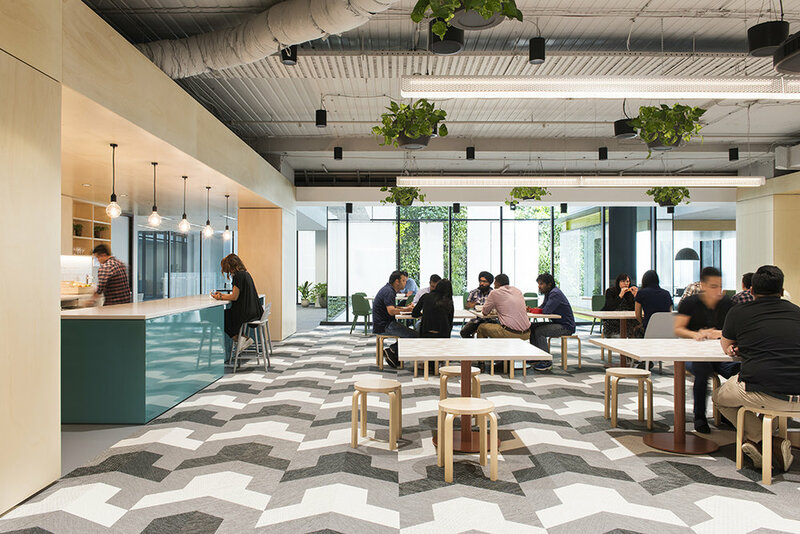 They hired Futurespace to design the fit out and saw it as an opportunity to cement their culture and align the team. The defining features of the new environment include the Central Café/Breakout Space and the Open/Collaborative Meeting zones. These spaces in the new workplace provide the first opportunity for the team to really come together and work towards common goals. Koskela supplied furniture that is highly flexible to facilitate this collaborative agenda. Futurespace were also able to customise finishes to suit their scheme, which combines bold colour with natural elements such as indoor plants and timber.